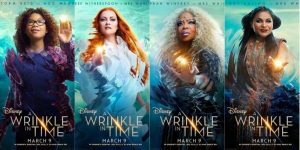 HomeFeaturedGet Your Tickets for the BlackSci-Fi.com A Wrinkle In Time Screening! Get Your Tickets for the BlackSci-Fi.com A Wrinkle In Time Screening! There’s still time to get your tickets for the BlackSci-Fi.com screening for A Wrinkle In Time! If you want to attend a special screening for Ava Duvernay’s upcoming A Wrinkle In Timescreening, that will include a discussion about STEM, and a wrap up party at the world famous Amalgam Comics & Coffeehouse, look no further. From the event’s official website: Join us for a screening filled with extra-planetary adventures hosted by Kennedy Allen aka ‘Storm Tribble” of the Black Tribbles podcast and Jr. Emcee & “On The JOB with Lani Lou” host, Lani Kai. The screening will feature a conversation with all-star Dr. Derrick Pitts, Chief Astronomer of the Franklin Institute, as Black Sci-Fi.com, Teaspoon & Pound Media and WPFSI celebrate girls and STEM. After the screening, the event will continue at Amalgam Comics and Coffeehouse for a special STEM centered after party featuring presentations given by paleontologists David Wilcots of Dinosaurs, Fossils and Adventures and Aja Carter of The Academy of Natural Sciences. Representatives from the Franklin Institute Youth Programs will also be in attendance. The after party will be free and open to the public. The after party at Amalgam Comics and Coffeehouse is from 2:30 pm to 4:30 pm. Head here for directions to the store. The event is a celebration of STEM and #blackgirlmagic. Ava Duvernay’s $100 million magum opus is the first movie directed by a black female director with this budgeted amount, and the fact that its a movie that features a heroine of color using science to save the day is an added plus. If you’re in the Philly area, have a daughter, a son, or just want to support a great movie/ event, head to the below link, and sign up for this once in a lifetime event. You won’t want to miss it. Tickets can be purchased online via Eventbrite at https://ourtimetowrinkle.eventbrite.com/ for $25.